7:52 p.m., Jan. 31, 2012--Patrick J. White, 59, died Jan. 29, in intensive care at Christiana Hospital in the company of his wife, Ellen Fox, and his sister, Tina Daniels. After complications from surgery in 2008, both his legs were amputated below the knee, along with part of his right hand. Recently, after injuring his shoulder in a fall at home, he had two more operations from which he did not recover. 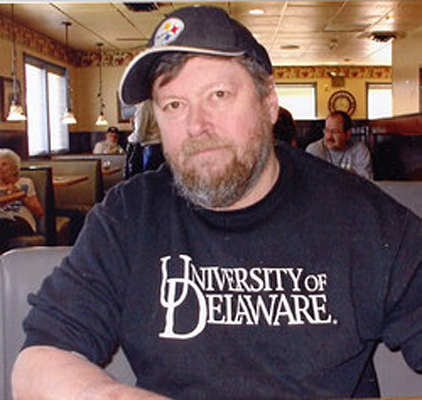 An alumnus of the University of Delaware, he taught in UD's Department of English for many years. He was affectionately known as "Whitey" by his many students and colleagues at the University. His diverse interests are reflected in his lecturing on the Johnstown Flood and publishing on Edgar Allan Poe's "Ulalume." He was a Civil War enthusiast who belonged to the Civil War Preservation Trust and the Friends of the National Park at Gettysburg, Pa., which he frequently visited. He was also a Pittsburgh Steelers fan. Dr. White taught at William Penn High School (1975-84), the Chesapeake Corps Center in Port Deposit, Md., (1984-86), Delaware Technical and Community College (1986-2005) and the Associate in Arts Program on the Wilmington Campus of the University of Delaware. His main teaching from 1986 to the present was as a supplemental faculty member in the Department of English and most recently as an assistant professor of English on the Newark campus. He received the University's Excellence in Teaching Award in 1997 and again in 2003. Charles E. Robinson, professor of English, said, "Whitey was beloved by his hundreds of students in courses in both English and American literature, ranging from freshman composition to sophomore surveys to advanced classes in Shakespeare and American literature to the Civil War. Articles in The University of Delaware’s student newspaper, The Review, reveal his many accomplishments, including being ranked No. 47 in a list of the top 50 highest-rated professors in the country." In 2008, Dr. White underwent open heart surgery. The surgery was successful, but he had an allergic reaction to Heparin, and three months later his legs were amputated below the knee, and he lost part of his right hand. In November 2008, a fundraising event to help pay his medical expenses was held in Memorial Hall. "Whitey's lecturing abilities were never more evident than in his witty address to the many 'Friends of Whitey' who crowded Memorial Hall," Robinson said. "The event and Whitey's lecture and self-deprecating humor, with references to his hero Ulysses S. Grant, was summarized in The Review dated Monday, Nov. 10, 2008." Dr. White is survived by his wife, Ellen Fox, who also teaches in the English department at UD; his mother Joan Herman Wolfe; sisters Kathy Gibson and Tina Daniels and her husband, Brent; nieces Allison, Ava and Jennifer; nephews Jacob, Robert and Michael; and brother-in-law Mark Martino. He was preceded in death by his father, Harry White, stepfather, Dale Wolfe, and sister, Cynthia Martino. Robinson said, "Whitey was once quoted in The Review as follows: 'As far as retirement or anything, I really enjoy my job and I’m one of those people that when I leave, I hope they carry me out, hopefully with a cheering crowd,' he says, laughing. 'And I hope they’re cheering for the right reasons.' We will be cheering for the right reasons to honor his memory at a memorial service on Feb. 3." A memorial service for Dr. White will be held at 4:30 p.m., Friday, Feb. 3, in Room 127 of Memorial Hall. Donations in Dr. White's memory may be made to the Department of English, University of Delaware, Memorial Hall, Newark, DE 19716. Condolences may be left online at the Spicer-Mullikin Funeral Homes website.